Yes, this is pretty much how we went in the water. 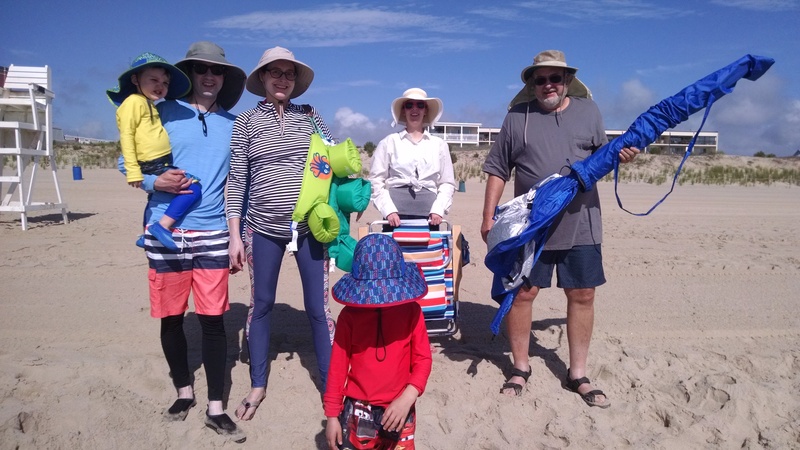 We went to the beach this summer with two of our daughters, a son-in-law, and two grandchildren. I followed my daughters’ lead and not only put on plenty of SPF50 sunscreen every time we went out, I covered up with a hat, blouse, shorts or capris to enjoy the beach. None of us got any sunburn. We came back tanless, even after four mornings of romping in the surf, sand, and sun with perfect weather, barely any clouds in the sky. It was awesome—both the beach and the not burning with pain and sore, reddened skin. But I couldn’t help but flash back to my years and years of needlessly exposing myself to ultraviolet sun rays and increasing my risk of skin cancer. I remember so many excursions to the beach—especially the year and four summers I lived in north Florida—when I was actually disappointed when we arrived at the beach too late in the day to get very much sun. I lived by the sun rule: the sun burns the most between the hours of 10 to 2 and if I couldn’t get in a least an hour or so in the sun, I was not happy. If clouds came up, I was half mad. Seriously. I also “worked on my tan” by laying out in the backyard, on my deck, on a hilltop at my college, and mowing with a tank top and shorts. Helping Dad by driving tractor in the field was even welcome because I knew there I would get a real tan, even if it ended up being kind of a farmer’s tan. Oh what a price we pay for our ignorance and what’s the most unbelievable, there are many many who still haven’t gotten the skin cancer memo or wake up call. Even if you never get a single basal cell type skin cancer (the “best” and least dangerous kind), we age our skin by decades the more sun we expose ourselves too. About 12-15 years ago I quit trying to tan. A year and a half ago I had my first basal cell cancer removed and the scar is still very visible on my chest. I’m not happy with the particular surgeon who had his very young physician assistant do the actual sewing up on me. I guess he left his signature on my neck. I know that more are possible in my future—with a sister and mother who have also had such removals. Basal cell cancers are supposedly the “good” kind (not considered melanoma) because they haven’t spread, but the concern is to catch them early. The American Academy of Dermatology says “Melanoma is the deadliest form of skin cancer, but when detected early, is highly treatable.” I now have to have my skin checked twice a year. 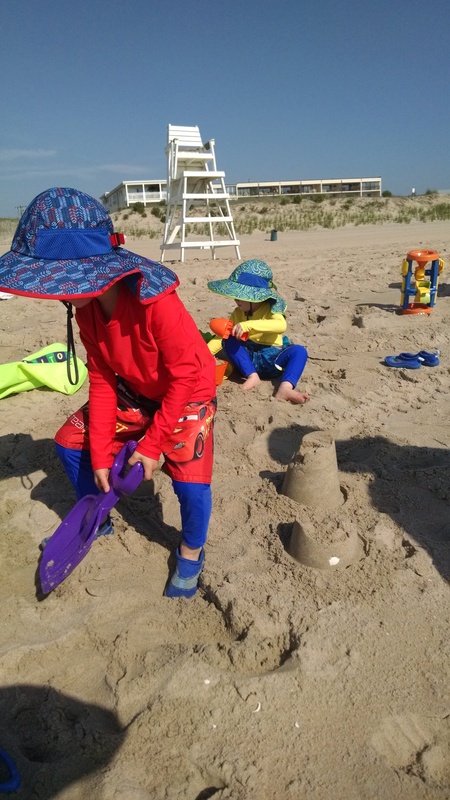 My grandsons playing in the sun. No burn worries. I still love the beach and I love people who still sport tans just because that’s the look they prefer or the lifestyle that turns them a rich beautiful shade of brown. But year after year, it increases our chances of skin cancer and the certainty that as 80 and 90-year-olds, our faces will be leathery and our necks lined deep with wrinkles, freckles and worse (scars from skin cancer surgeries), or, heaven forbid, an earlier death. I especially have trouble understanding those who frequent tanning beds. Experts warn it increases the risk of getting skin cancer, especially when begun under the age of 30. Some may argue that it is safer than the sun, and lotions may promote skin softness and delay dried out skin, but over time, I see deep wrinkles ahead. Okay, so wrinkles don’t matter much and looking older than one’s age isn’t a worry for some in the grand scheme of life. Like they say, whatever makes people happy. Of course the sun also provides Vitamin D in megadoses—one element of a healthy life, but most of us get enough sun and Vitamin D in just the normal routines of going in and out of doors. But I hope you will seriously consider what sun or tanning beds are doing to your skin and life if tanning is still your thing! For a free infographic to post in offices, schools, churches, etc., find them online at: https://www.aad.org/public/spot-skin-cancer/free-resources Or write to me and I’ll send it to you by regular mail. Send a self-addressed stamped envelope to anotherwaymedia@yahoo.com or Another Way Media, P.O. Box 363, Singers Glen, VA 22834. I’m in the no-tan camp too. My moisturizer contains sunscreen and I often wear a sun-visor out doing errands. I often wonder how my exposure in the tomato patch as a teen has affected my skin. Never, ever would I use a tanning bed. My mother was so so happy to see this article and raised again concerns she has for some spots on her own face/skin and I’m sure she’ll be getting checked out again. May others be motivated to do the same! I’m laughing at myself (or more like kicking myself) for all those afternoons as a teenager laying in the backyard slicked up with baby oil. I remember my Grandma Cline – much more sensible than her ignorant granddaughter – who wouldn’t go out to work in the garden without her huge brimmed straw hat and nylons that she pulled up over her arms. Oh wow, I should have mentioned those slicked up baby oil days….! My grandmother covered up religiously also, dust bonnet on her head, stockings etc. I’ll have to ask my mom whether Grandma put nylons over her arms. They were smart! We have all learned a lot. I mention on my blog about the years of not-knowing and loving to tan. The tricky part is that skin damage can happen years ago and as a metastatic melanoma patient, the dues are being paid now! So very true. Thanks for your affirmation!